Write. Learn. Lead. Reduce the Writing Project to its simplest elements, and you get these three pathways to NWP. This blog is dedicated to all the educators traveling those pathways, finding and building NWP. Many of us, probably more than 100,000 by now, came to the NWP at a traditional Invitational Institute: a program where these three pathways are interwoven. That was my route, and it started when Gloria Neubert, professor in English Education at Towson University, showed up at the out-of-the-way high school where I taught English and Journalism. We were a large and confident high school located in the county seat of a rural community. We were just big enough to look no further than the borders of our campus and just isolated enough that new ideas in education didn’t often reach us. So when a Professor of Education from thirty-five miles away came to our department meeting, it was a red-letter day. It was Spring of 1984. I want to tell you about the Maryland Writing Project, she said. It’s a program that started in California and now we have it in Maryland. 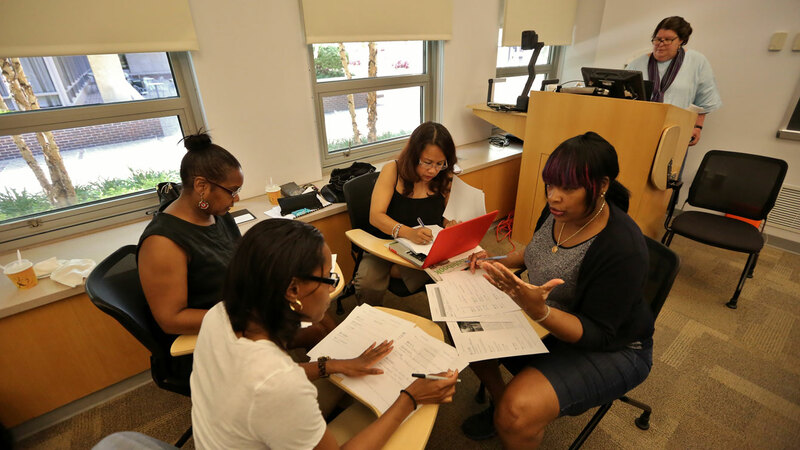 We have a summer institute where teachers teach each other how to teach writing. Hmm. Learn from other teachers? Teachers, she continued, would spend five weeks, four days a week in this program. Really? Every day one of the teachers will present to and lead the group. Like when you research a topic in education and do a class presentation? The presentation comes from what that teacher has learned through her own teaching and the work of her students; what that teacher is inquiring about in her teaching. Wait, not something assigned to us by the professor? Oh, and the teachers come from all grades and all subjects, even college. All mixed together? Why would anyone do that? We also spend time reading and talking about research and lots of time writing. Writing? Like a term paper or a final essay? I remember Gloria as having had a commanding sense of timing, so I imagine there was a pregnant pause before she continued: The writing is at the center of everything. Everyone in the program, including the facilitators, will be writing, and we will write what we choose to write, what matters to us. We will meet in response groups and form a community of writers. My well-mannered English department listened attentively, yet she must have read the doubt on so many faces: But we’re not writers, we’re teachers…teachers of literature. We teach what other people write…people who are writers. Another pause, perhaps, and she added: Trust me. This is something different. She said again: Trust me. This is different. There is so much I remember from that summer 30 years ago where we assembled as peers to write, learn, lead. I remember each member of my brilliant response group, the exhilaration and terror of sharing my writing with them, their penetrating questions and unwavering support for what each piece was capable of becoming in the next draft. One of us, Leslie Goetsch, would go on to actually write the novel we all dreamed about and to co-direct the project. Beyond the response groups I remember, too, the exhilaration and terror of the read-around groups, author’s chairs, and open mic nights. I remember assembling anthologies by hand and decorating the covers of portfolios. I remember learning with my reading group, the experience of reading deeply together and talking our ways into Ways With Words alongside Errors and Expectations alongside Lessons from a Child alongside A Writer Teaches Writing alongside Prospect and Retrospect alongside countless other articles from that time period. I wondered, how had I completed an entire graduate degree without experiencing such passionate debates about research as I experienced that summer? And each one of us was called to lead. I remember details from almost every presentation, starting with the amazing Jeanne Reardon, a first-grade teacher who may have been the best science teacher I’ve ever witnessed. Jeanne would go on to write books about science workshop, but that summer, before she set us to observing and writing about some natural phenomenon, she read to us as she would with her first graders. The sound of her voice was magical and alive as she read Myra Cohn Livingston’s “Spring”: “O seed and root, send forth a tiny shoot!” In that single slice of a first-grade classroom I thought: literature is dead in my high school classroom. I’ve killed it dead. Everything must change. My friend, a college literature teacher, said she had the same thought at the same moment and we must work together to reimagine our teaching. We did. Why had we never been put together like this before, across the grades and subjects where we could see the whole scope of a student’s journey? Why had we never watched each other teach like this and demanded of each other the theories and rationales that lay behind our work? Why hadn’t we stopped to study and probe the routines and the handouts and the reading selections we used, taking all the tools of the teacher’s trade as seriously as we took the work of others? Why hadn’t we stopped grading, grading, grading all those papers to look at them carefully, to endow them with the expectation that the writer in good faith is trying to communicate something? Like we did for each other in writing response group. Like we did for each other when we discussed the presentations, asking each other to unpack our teaching with the expectation that there was a reason and rationale for what we did. What we did was simple. We endowed each other with sense and authority and the expectation that teaching had an authentic intellectual life that, of course, each of us as professionals would participate in. We pulled brilliance from each other by listening to each other with the expectation that brilliance was there. We became fascinated with teaching by approaching it with the assumption that it was, in fact, fascinating. What if we approached our classrooms, our colleagues, our students that way? Write. Learn. Lead. In Teachers at the Center, Jim Gray described the genesis of our NWP in the nagging dissatisfactions of conventional models of professional development, of schooling, of university/school hierarchies. After an embarrassing experience leading an NDEA Institute in Hawaii where teachers were lectured at as if they were students, he determined to take the conventional model and ‘turn it on its head.’ An institute in Davis, California gave him the opportunity to do just that, and to set the direction for the first Bay Area Writing Project Summer Institute in 1974. It was like nothing else. In Maryland, in 1984, it was like nothing else. Now, decades later, NWP is still a thriving network and a peer-learning model. We are no longer alone. We can proudly claim that many elements of NWP practice have become commonplace in professional development: teacher leadership, communities of practice, action research, looking at student work, PLCs, and PLNs. Invitational institutes are still offered around the country, but there are also many more pathways to NWP than ever before. Beyond the structures and practices and the rhetoric, what still feels special, what still feels powerful enough to send us out like Gloria Neubert to scour the countryside for the next group of summer fellows, is the experience of a passionate learning community where we endow each other with sense and authority and the expectation that teaching has an authentic intellectual life. This blog is dedicated to all of us who create the NWP together when we create that passionate learning community and say to our colleagues: Trust me. This is different.